HERE ARE A FEW THINGS YOU MAY FIND INTERESTING THAT I GOT FROM SKIP YMH'S BBS. I'd like to thank very much all the packet groups who have helped both directly and indirectly with our latest efforts at bringing out the next generation of stand-alone terminal node controllers here in the U.S. Though the efforts of a lot of different TAPR sites as well as Tucson, I'm proud to announce the official start of Beta testy with 1 9 sites and 1 80 TNC boards involved. We will be happy to keep all groups updated with our activities, and I'll keep project updates on PRNET. Our boards should be delivered, fully assembled and tested, with 24K EPROM and 6K ROM on-board, and with all connectors, etc., before the year is out. 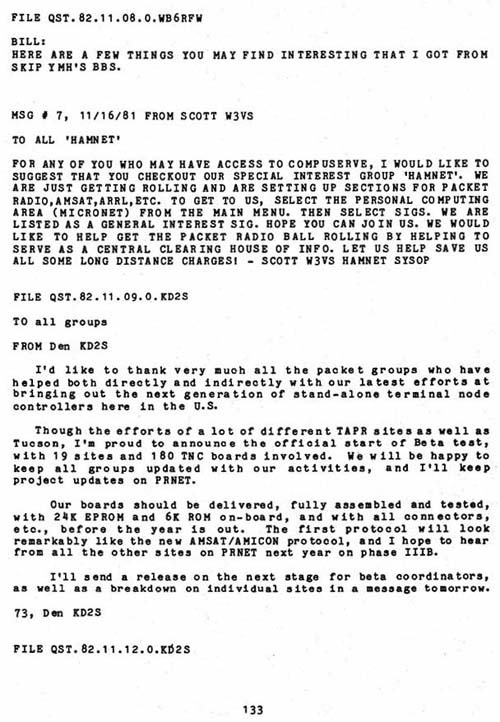 The first protocol will look remarkably like the new AMSAT/AMICON protocol, and I hope to hear from all the other sites on PRNET next year on phase IIIB. I'll send a release on the next stage for beta coordinators, as well as a breakdown on individual sites in a message tomorrow.